The Dragonflies. - GRANADA WILDLIFE a complete wildlife experience. We have several different types of wetland habitat in the area, each having interesting species. There are several coastal sites in Granada and Malaga Provinces which produce a good number of species including the uncommon Long Skimmer (Orthetrum trinacria), Black Percher (Diplacodes lefebvrii) and Banded Groundling (Brachythemis leucosticte). Just inland from the coast there are several largish rivers with lots of smaller tributaries which abound with Dragonflies and Damselflies and as long as we get some rain over the winter period these continue to flow right through the summer giving you a chance of catching up with several difficult to locates species such as Orange-winged Dropwing (Trithemis kirbyi), Ringed Cascader (Zygonyx torridus), Blue-eye’s / Goblet-marked Damselfly (Erythromma lindenii) and the magnificent Splendid Cruiser (Macrmia splendens). Other more common species can be seen at most sites with year round water include Violet Dropwing (Trithemis annulata), Southern Skimmer (Orthetrum brunneum), Red-veined Darter (Sympetrum fonscolombii), Migrant Hawker (Aeshna mixta), Lesser Emperor (Anax parthenope), Large Red Damselfly (Pyrrhosoma nymphula), Iberian Bluetail (Ischnura graellsii), Epaulet Skimmer (Orthetrum chrysostigma), Common Darter (Sympetrum striolatum), Broad Scarlet (Crocothemis erythraea), Black-tailed Skimmer (Orthetrum cancellatum) and Blue / Common Emperor (Anax imperator). View my Dragonfly web album here. See a more complete list here. The mountain rivers of the Sierra’s around Grazalema and Ronda over on the Malaga / Cadiz boarder can produce some exciting species which are the most active and difficult to photograph. They include both Small (Onychogomphus forcipatus) and Large Pincertail (Onychogomphus uncatus), Western Willow Spreadwing (Lestres viridis), Orange-spotted Emerald (Oxygastra curtisii), Orange Featherleg (Platycnemis acutipennis) and Pronged (Gomphus graslinii) and Western Clubtails (Gomphus pulchellus) plus the cracking Western Spectre (Boyeria Irene). 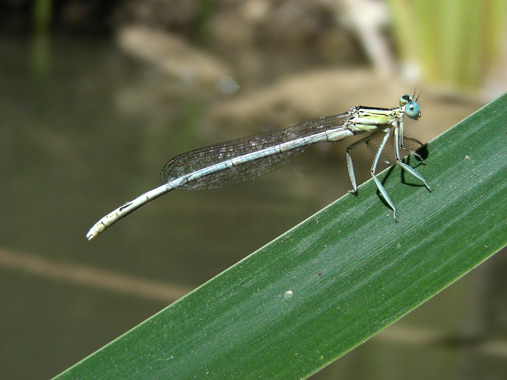 There are many small pools in the hills of Granada and Malaga province which have a rich marginal flora which encourage a good number of species to reside in the area, some of the rarest are Small (Lestes virens) and Migrant Spreadwings (Lester barbarus), Small Red-eyed (Erythromma viridulum), Black Pennant (Selysiothemis nigra), Dainty Damselfly (Coenagrion scitulum) and Mercury Bluet (Coenagrion mercuriale). In the sierra’s around the Province of Granada we have quite a few rivers that run all year round and hold most of the fore mention species plus a few others including Beautiful (Calopteryx virgo) and Copper Demoiselles (Calopteryx haemorrhoidalis), Common Winter Damselfly (Sympecma fusca), White Featherleg (Platycnemis latipes), Keeled Skimmer (Orthetrum coerulescens) and Common Golden Ringed Dragonfly (Cordulegaster boltonii). 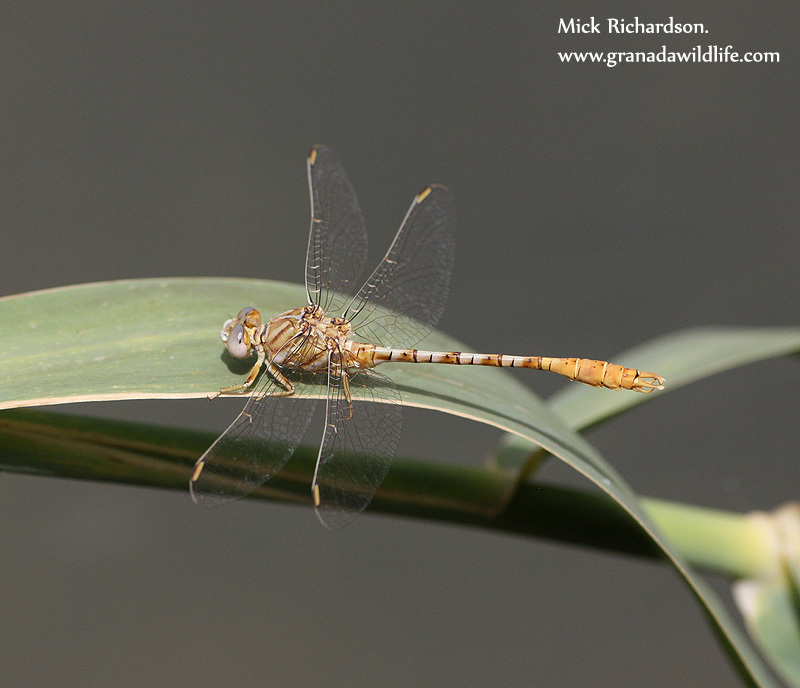 There are a couple of small reservoirs in the area where with a bit of luck you can also catch up with the uncommon Desert Darter (Sympetrum sinaiticum).